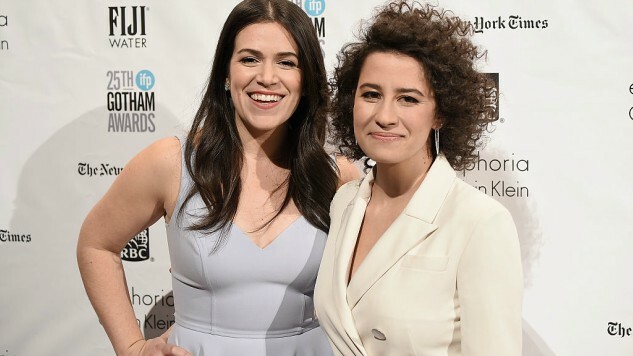 Broad City will premiere its fifth and final season in early 2019 on Comedy Central, the network announced Thursday, but creators and stars Ilana Glazer and Abbi Jacobson have signed a huge first-look television deal with Viacom. The duo currently have three projects in development under the new deal, including Mall Town USA, Platinum Status and Young Professionals. To give you an idea of what to expect next from the multitalented duo, Comedy Central describes Mall Town USA is “an animated comedy that follows the afterschool misadventures of a 13-year-old girl navigating the complexities of life in the classic microcosm of American culture that is The Mall.” The series is written and created by Gabe Liedman (Broad City, Brooklyn Nine-Nine), and executive produced by Glazer and Jacobson. The network also annnounced Platinum Status, which follows the story of professional back-up singer Noah (Eliot Glazer), a gay guy who’s always felt left out of the “community.” Set in the hipster-heavy east side of Los Angeles, he’s dumped by his boyfriend of 10 years and rebounds in the most unexpected way—by hooking up with a girl. With help from his friends Kevin and Mimi, and guidance from his kinda-sorta-girlfriend Alexa, Noah tries to evolve both in the bedroom and the recording studio. Eliot Glazer will write and executive produce, and Ilana Glazer will also executive produce. Young Professionals follows five housemates growing up—personally, politically and professionally—in the hopelessly absurd world of Washington, D.C. At age 24, David Litt became one of the youngest White House speechwriters in history. Described as the “comic muse for the president,” Litt served as the lead writer for many of President Obama’s most memorable comedic moments, and his recent memoir, Thanks, Obama, is a New York Times best seller. Young Professionals is written by and executive produced by Litt, with Abbi Jacobson and Ilana Glazer also serving as executive producers. Glazer and Jacobson have incredible chemistry and dynamic personalities. It’s no surprise their show went from a web series to a full-fledged comedy hit, earning critical and fan praise. The series has received a Writers Guild of America nomination and has been nominated by the Broadcast Critics Association for Best Television series two years in a row. Ilana Glazer has received back to back nominations for her performance on the show, too. Glazer most recently starred in the bachelorette comedy Rough Night with Scarlett Johansson, Zoe Kravitz and fellow comedy genius Kate McKinnon. Jacobson can be seen in the Netflix drama 6 Balloons with Dave Franco and recently lent her voice to The Lego Ninjago Movie. When not acting, Jacobson hosts the podcast A Piece of Work, in which she discusses modern and contemporary art in lively conversations with curators, artists and friends. She also is a well-established writer and is about to publish her latest book, I Might Regret This. We look forward to all the new entertainment these two will bring us as we say goodbye to their beloved Broad City. Revisit Paste’s 2017 interview with Glazer and Jacobson here.